If you have a tree problem that needs immediate attention you can call Bill Crumby 24 Hours a day 7 days a week on 07778 412145. We can then arrange to have the tree inspected or a team response to sort out the problem. and can allow retention of a tree in a confined space. It can also be used to create a desired appearance or to make a tree more suited to its surroundings. for drivers and pedestrians or prevent low hanging branches from hitting buildings or people. It can also be used to allow more light/air to plants beneath. This operation involves tree removal leaving a stump at a pre agreed height. The tree will either be straight felled (on an open site) or dismantled (on a restricted site). This operation involves grinding out a tree stump using a stump grinding machine. This operation involves the use of a wood chipper to shred up branches and cord wood to be removed from site. 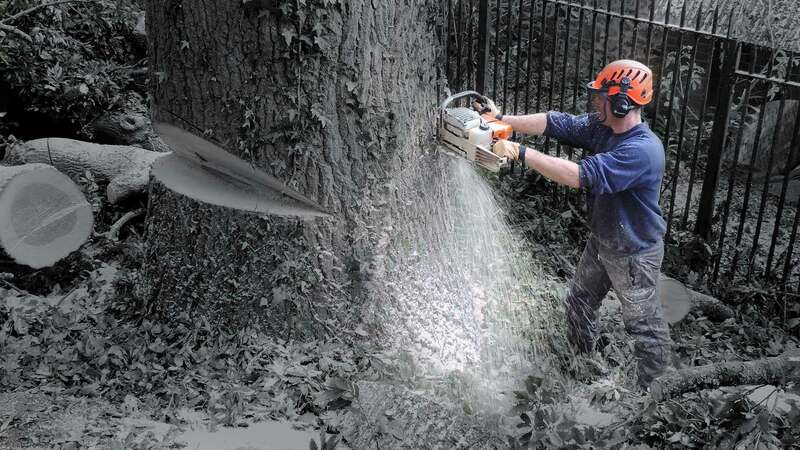 Greentrees have a large 8” high capacity chipper and a narrow access 6” tracked chipper, ideal for going into confined spaces and back gardens. We now offer Picus 3 Tomographs with Picus 3 digital callipers to give an accurate decay and residual wall reading. This highly sophisticated equipment can build up a picture of internal decay inside a tree by measuring the speed of sound waves through the timber. The Tomograph then uses a computer program to produce a two dimensional image that details not only where the decay is but how severe it might be. A three dimensional image can also be produced by combining multiple Tomographs at various heights on the same tree. Picus 3 Tomograph is a non-invasive tool for mapping internal decay in trees. picture of decay extent and importantly an ACCURATE measurement of the Residual Wall thickness. Picus Tomographs without calipers are not accurate and many Local Authorities will not accept them as part of a planning application. • excavating trenches for utilities near tree roots. periods of ground frost or when the ground is saturated.